HANN A2 Art Table This multi-purpose art table is a sturdy and attractive platform for student projects. The base is constructed of solid maple with bolt reinforced mortise and tenon joints for strength and maintainability. The heavy base components and wide feet fitted with adjustable floor glides contribute to excellent table stability. The "double-bolt" lower leg spreader and additional upper leg spreader provide superior rigidity and resistance to loosening. Standard top is 1-1/4" thick maple grain patterned plastic laminate w/ 3mm PVC edgebanding. Other choices include plastic laminate with ArmorEdge and 1-3/4" thick maple. 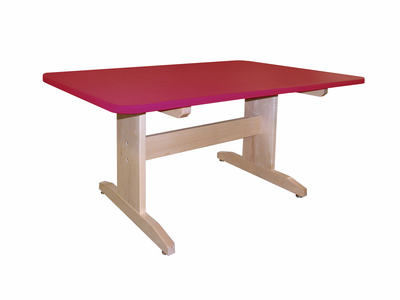 This art table has a solid hard maple base and a maple-grain/red/blue/black plastic laminate top with 3mm Edgebanding.These tables are built to last with thick solid hard maple components. The upper and lower spreaders are connected to the leg panels with bolt reinforced mortise and tenon joints. A total of six draw bolts and a tall lower spreader provide excellent rigidity and maintainability. Adjustable floor glides are included. The overall size is 60"W x 42"D x 29-3/4"H.
Overall size is 60"W x 42"D x 29-3/4"H.
Table with a 1-1/4" thick plastic laminate top w/ ArmorEdge. Table with a 1-3/4" x 30" x 60" hard maple top, ~30" high. These tables are built to last with thick solid hard maple components. The upper and lower spreaders are connected to the leg panels with bolt reinforced mortise and tenon joints. A total of six draw bolts and a tall lower spreader provide excellent rigidity and maintainability. Adjustable floor glides are included.This multi-purpose art table has a solid hard maple base and a maple grain plastic laminate top with armor edge. The overall size is 60"W x 42"D x 29-3/4"H.
This multi-purpose art table is a sturdy and attractive platform for student projects. The base is constructed of solid maple with bolt reinforced mortise and tenon joints for strength and maintainability. The heavy base components and the wide feet fitted with adjustable floor glides contribute to excellent table stability. The �double-bolt� lower leg spreader and additional upper leg spreader provide superior resistance to racking and wobbling. The 1-3/4� thick heavy duty top is comprised of laminated solid hard maple. Overall size is 60�W x 30�D x 30-1/4�H.